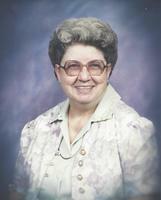 Provide comfort for the family of Mary Simmons with a meaningful gesture of sympathy. Mary Helen Simmons, 94, passed away Wednesday, February 6, 2019 at Benton House of Tiffany Springs, K.C., MO. Mary Helen was born December 26, 1924 in Brookfield, MO to Isaac Floyd and Fay Etta (Jimerson) Baker. She was a 1943 graduate of the Shawnee Mission Rural High School in Merriam, KS. Mary Helen married Lester Lee Simmons on October 25, 1943 and they lived in the Gladstone, Kansas City area until moving to her second home, Benton House, at the age of 92. For many years, Mary Helen was very actively involved with the Antioch Baptist Church and she and Lester loved fishing at Lake of the Ozarks. She was preceded in death by her parents; her husband Lester; brothers Andrew Floyd, Edgar Lane, and Raymond Edward Baker; and sister Ruby Etta Webb. Mary Helen is survived by numerous nieces, nephews, great nieces and nephews, and a host of friends and extended family. A graveside funeral service will be held: 11:00 a.m., Thursday, February 14, 2019 at the Leavenworth National Cemetery, Leavenworth, KS. Memorial contributions can be given to the Cancer Research Institute or the American Diabetes Association. To send flowers in memory of Mary Helen Simmons (Baker), please visit our Heartfelt Sympathies Store.